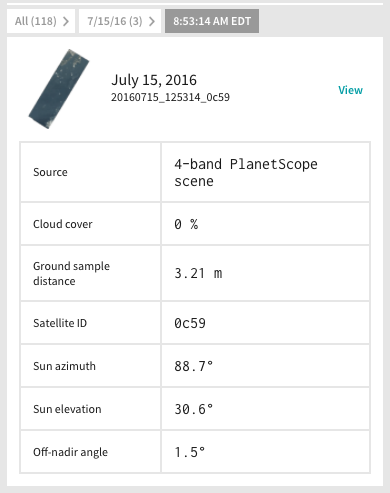 Planet Labs recently announced their open Planet Explorer Beta. We decided to use it to look at the Toronto Harbour. 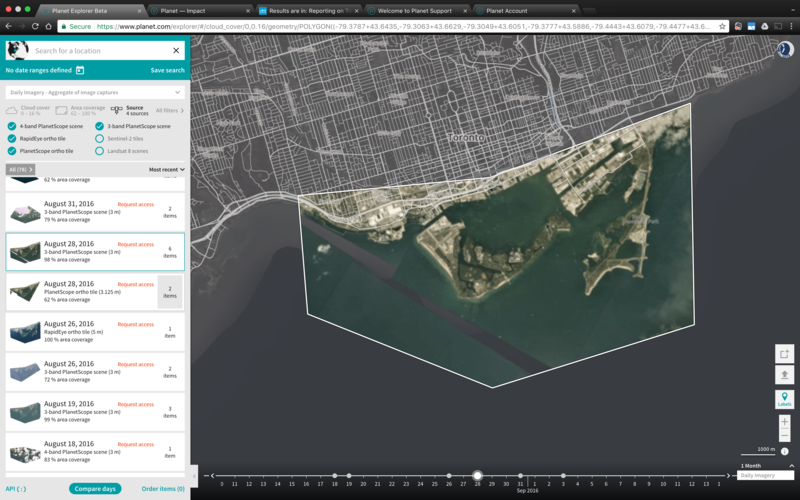 Lake Ontario Waterkeeper reported on the poor water quality in the harbour, mapping 9 outfall locations where sewage is flowed into the lake. As LOW mentions, one of the noticeable traits in the harbour is a brown plume that originates from the Don River. This could be sediment from the river, or also contain bacteria. Using Planet Lab’s daily satellite imagery, we will be able to view these plumes over time. Based on our search criteria, not all of the days are available – but there is a good amount. At Robot Missions HQ we decided to take a first look in to this, using the publicly available data. Let’s start off with one of the most recent days available, March 3, 2017. Here you can see our search criteria and area that we will be looking at. The plumes in this image are most likely sediment, given the time of the year and that there was no precipitation on March 2 or 3. Looking at August 26, 2016, we can see a plume from the Don River. Using the multiple satellite imagery lets us verify that we aren’t mistakingly looking at a cloud. Looking at the imagery on August 28, 2016, the plume has dispersed. LOW did a water sampling on August 30, 2016 (see their data here). It reported no precipitation, and low E. coli levels in the water. What we can guess here is that around 2 days, the plume gets dispersed. If this plume contained bacteria, then we can understand that in 4 days the water returns to less E. coli. There’s speculation here, but what we learn is seeing the images lets us know that there was a plume a few days (4) prior to the sampling – despite there not being any rainfall. By September 6, 2016, the E. coli levels were significantly decreased to safe levels. Here’s where it gets interesting – albeit in a slightly confusing way. On July 15, 2016 we have both a satellite image and a water quality sample. 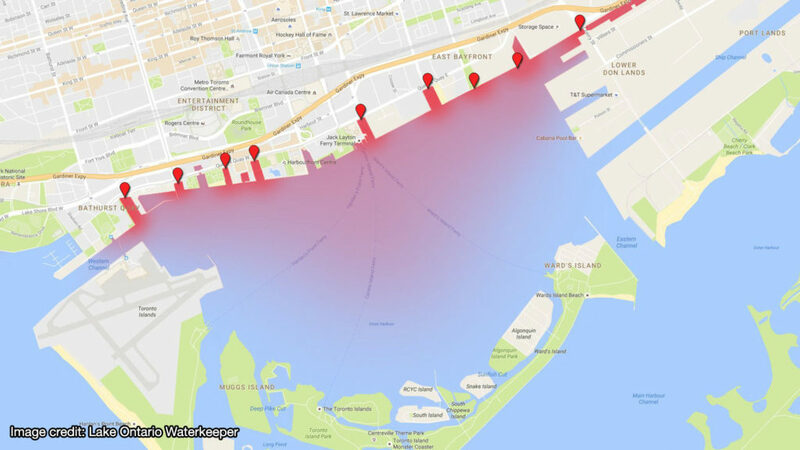 The water quality samples report the most E. coli at Bathurst Quay (43°38’11.0″N, 79°23’47.8″W) and Pawsway (43°38’15.4″N, 79°23’01.7″W). The colour differences between days and the lower resolution in this image make it difficult to compare. For example, what if there was a larger plume that was over almost the entire harbour? If we can correspond a satellite image each day, and previous day, to the days the water sampling occurred, then this could possibly lead to being able to see a correlation to the plumes — or not. As we saw with the August 26 & 28 imagery, it raised the question: How quickly does the water disperse? Viewing more daily satellite images this summer might be able to lead us to answer this question. It will be interesting to see if we can get daily imagery between Aug. 30 & Sept. 6 to see if there were any additional plumes. If there were not, then we might be able to say that this lead to the decrease of E. coli values. While satellite imagery might make regular monitoring faster, as we saw in this example, we might not be able to rely on just seeing if there was a plume. It will be great if we can access higher quality images, especially for July 15. The satellite imagery lets us observe our environment from a different perspective, and over time. At Robot Missions HQ, we’re looking forward to using it to investigate other shorelines and plan out future missions with the robot. Using the Planet Labs explorer to look at these plumes in Toronto Harbour as a test bed for the rest of Earth excites us for what might be possible to monitor. What if we can detect plumes and automatically send out a fleet of robots to sample and clean up? 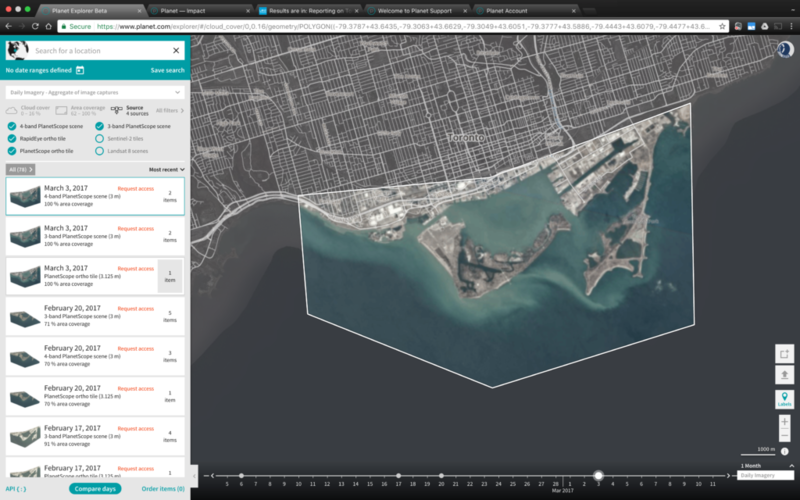 Special thanks to Lake Ontario Waterkeeper for releasing their data, and the Planet Labs Explorer Beta.